The 19mm f/2.8 is a compact, super-wide-angle lens with an angle of view of 96°. Its relatively high speed considerably expands its range of applications, especially in landscape, architectural and fashion photography. It is also an ideal lens for snapshots and for photojournalism, even wide open. Very high contrast, perfect reproduction of the finest details and ample imperviousness to stray light even at full aperture emphasize the versatility of this wide-angle lens. A built-in filter revolver comes with four different filters . 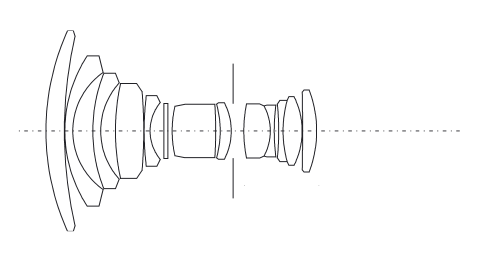 Second version of 19mm F/2.8 model, recalculated and designed at Wetzlar. High contrast and perfect rendition of the finest details of the subject are but a few of the strengths of this versatile wide-angle lens. It has rear component focusing as well to ensure outstanding results in the near range. There's no front filter thread but you can use built-in revolver filters (NDx1, YG, OR and KB12). It is excellent for fashion photography, reportage and dramatic landscape perspectives; its compact size makes it very practical and comfortable to handle. The high speed at full aperture and its excellent contrast rendition facilitate focusing, even under critical conditions.